Given their place as the most powerful public-employee alliance, teachers' unions are front and center in the debate that is going on in Wisconsin. But beyond the high-decibel clashes between Tea Partyers and public-employees' unions are contentious education-policy issues that reformers, teachers' unions and analysts have debated (and sometimes even collaborated to fix) for years. Although teachers' contracts are often singled out, in practice the rules and regulations most commonly cited as problems by superintendents, school reformers and not infrequently teachers themselves are often found in state law as well. That's why schools in states without teachers' unions tend to operate pretty much like schools in places with powerful unions. In Virginia, for instance, where I served on the state board of education, it would be difficult to tell the difference between most of our schools and schools in heavily unionized Maryland. It's also why teachers' unions are not the only culprit here. They did not unilaterally create these rules and regulations  someone signed those contracts or passed those laws. 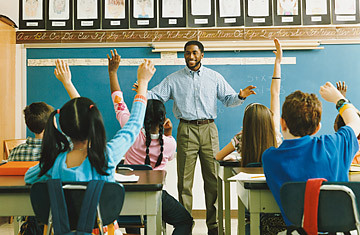 Provisions in teachers' contracts limit who can conduct evaluations and how often, and they even specify how much notice a teacher must be given prior to being observed. By contrast, in most professional workplaces, evaluation is ongoing and both formal and informal. It's the same way in many high-performing schools where evaluation is a regular and continuous part of the improving process. Classroom "visits are not just more numerous but dramatically so" in the best schools, says Tim Daly, president of the New Teacher Project, a nonprofit that recruits teachers and analyzes education policy. In those schools, instead of "zero, one or two [visits], it's 30 to 40 per year," according to Daly. With layoffs looming, policies that require "last in, first out" are hotly debated across the country. These rules, which can be found in both state law and union teachers' contracts, require that teachers be laid off according to seniority, without attention to classroom effectiveness. In other words, when layoffs happen, newer teachers  who in some cases still have several years of experience  are let go first, even if they're more effective than the veterans who are displacing them. These policies would make sense if veterans were always better than newer teachers, but abundant research shows that longevity alone is not a great predictor of effectiveness. Last month, civil-rights groups won a landmark court decision in Los Angeles changing how layoffs and seniority rules work there. But just this week, an arbitrator in Hartford, Conn.  a city lauded by national leaders, including Arne Duncan, as a model for labor-management collaboration  ruled in favor of using "last in, first out" there. Bottom line: for any organization that is serious about effectiveness, quality-blind layoffs are nothing short of insane. 3. Forced transfers and "bumping"
Organizations recognize seniority in different ways. But frequently in education, seniority confers a set of powerful rights when it comes to transferring to new schools. In practice this means veterans can bump teachers with less seniority when jobs open up or that principals are limited in whom they can choose when filling positions. In other words, teachers can force their way into a school. When the New Teacher Project analyzed this practice, it found that the policy contributed to newer teachers leaving teaching. But parents don't need a wonky report to get the basic problem here: Shouldn't individual schools get to decide who teaches in them? Earlier this month, an arbitrator in Washington, D.C., gave 75 teachers  including chronically absent and demonstrably low-performing ones  their jobs back over a technical due-process issue. Reformers groaned, but union leaders applauded. Long considered a "third rail" of education policy, tenure is now under attack in a number of states where various rules are found as part of both state law and in collective-bargaining agreements. It's hard to find someone who doesn't think teachers and other workers should have due process before losing their job. What actually constitutes "due process" is a more contentious issue, but even teachers'-union leaders agree that in many cases, the rules are out of hand. Today teachers are overwhelmingly paid on the basis of two factors: length of service and academic degrees. Salaries are based on master schedules with columns for degrees and rows for years of service, so a teacher moves across lanes and up the steps as his or her career progresses. Most professions pay more for experience, and there is little evidence that most additional degrees improve teaching. More problematic is what's missing: differentiation based on how challenging teaching assignments are, hard-to-fill subjects like math, science, special education or foreign languages, and how effective teachers are in the classroom. The rules of economics don't stop at the schoolhouse door, and superintendents privately complain about having to pay physical-education teachers and physics teachers the same amount, even though it's easier to find coaches than physicists. Hard to find a better example of something that works great for the adults in the system but not so well for the kids whom schools are supposed to serve.